There’s two main components to Social City your population and leisure buildings. You need to balance the two of them to keep your citizens happy. If you don’t have enough leisure you can’t add additional people to your city. This guide will show you how to manage your cities leisure and population as well as how to use the city management tools that are new to the game. To grow your city your going to naturally want to add more population. Your resident buildings will do this for you. Once the building is ready the population icon will popup above it and by clicking on it you can add population to your city. Larger more expensive buildings will add additional population. You don’t want to go overboard with population because you also need leisure too. Look to your happy face icon and if it has a neutral look you know that your population is getting too high and you need some leisure buildings soon. Your icon will be yellow when this happens. 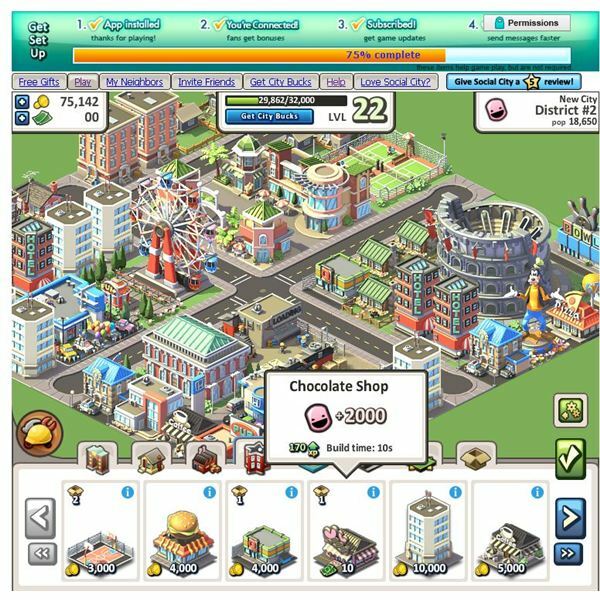 If you have never played Social City before try this game guide for more information. Your people need something to do so that’s where your leisure buildings play a role. There are dozens of different leisure buildings including shops, restaurants, hotels, movie theaters, and so much more. Each of these buildings will add leisure or happiness to your city. A happy face icon in your game means you have enough leisure. Once your population gets higher this can be a difficult task. Be sure to replace old low level leisure buildings so you can have maximum leisure in your game. Decorative items such as trees can also add some leisure to your city so don’t forget to add them. City Information – this screen will give you an overview of the district you are currently in. You will be able to tell the population level and the limit to that districts population. To add more room to districts you’ll need to expand them with game cash or by having enough Facebook friends. Moving Company -This is a fun management tool since it allows you to move your Facebook friend splaying the game into a building of your choice. Give them a job at a coffee shop or a mansion to live in. 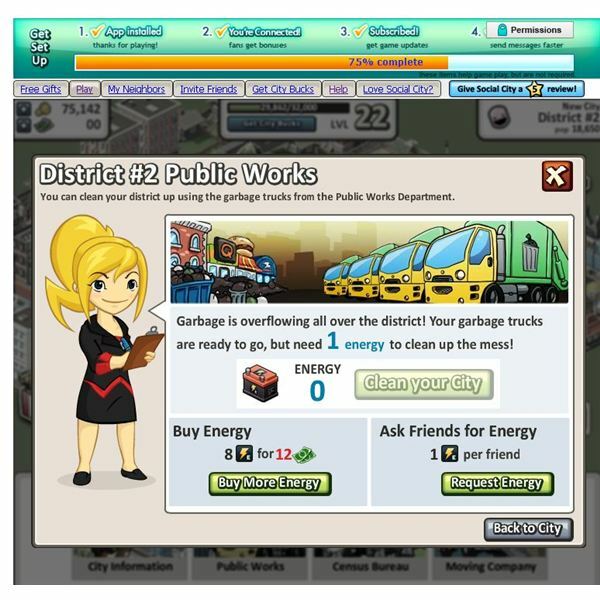 Public Works – one annoying aspect of Social city is all the icons that popup when your city needs cleaning. You cal clean these instantly with the public works truck. You’ll need Facebook friends to send you energy so you can complete the task, or you can use game cash. This is a quick way to free your city of the cluttering icons. Census Bureau – this building will do what your public works does except it clears population icons. Ask your friends for energy or buy it with cash to clear population icons from your screen. Social City has plenty of different structures to keep you busy. Be sure to check the game often for special buildings you can buy with game cash. Managing your city takes time to get used to but with practice, you’ll become a great mayor.